Workshops in Kreuzberg (Gemini new moon cycle started on June 13 th! We plant the seeds during this days). Alchemy through awareness and energetic exercises. Stretching the feeling body. The Goddess and the Warrior within Meet and relate to them inside. -The Goddess meeting includes the activation and embodiment of the Inner Goddess, nutrition, attraction, empowerment, rejuvenation, alchemical magic and we will be working-healing the feminine inherited and re-calibrating our creative glands and hormones with the Source. 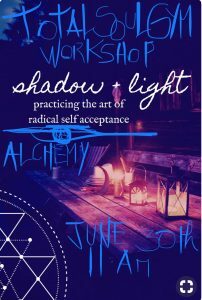 Embracing my Shadow Workshop Saturday June 30th. 11.00am. 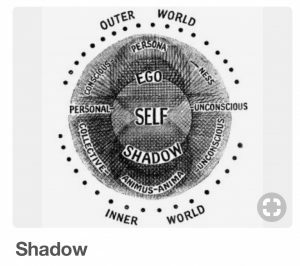 Integrating/embracing/dancing with my Shadow… through loving kindness. Using the mirror/others/projection technique. Integration and Alchemy. -Total Soul Gym. Coming back home to Love and Presence. Alchemy to align, heal and transform my “unresolved” energy, wrong beliefs, projected shadow, thoughts, inherited beliefs and destructive emotions. Chakra healing and transformation. Your mental, emotional, and physical distress is the result of energy blockages, and wrong beliefs supporting them. These meditations, exercises and energetic light-work, promote smooth, free flowing internal energy, good health, alignment and joy. 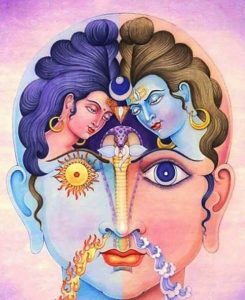 The connection and activation of the divine within. You will learn your own intuitive language through the observation and receptivity of your chakra centers. You’ll experience yourself as a multi-layered energetic being, growing in the fifth dimension. As you cleanse and unblock your energy centers, you will experience powerful shifts in thinking and you will feel increasingly empowered to fulfill your Divine Purpose. I will repeat this workshops in July, write me if you ‘d like to join! Other workshop or resource for private work available- Tapping, EFT emotional, freeing technique. Managing emotions, destructive and uncomfortable emotions. So if you feel like to join me in group or privately let me know!And if you want to share it with someone that could be interested, thank you very much! Previous post: Berlín in June 2018! Next post: Coming back home, to Love me/we more!